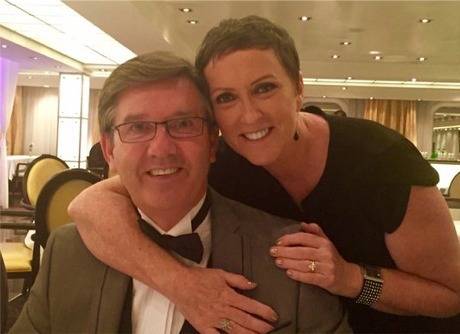 MAJELLA O'Donnell has celebrated another cancer-free birthday with husband Daniel as the couple sail through south east Asia on their luxury world cruise. Majella, who underwent a double mastectomy for breast cancer in 2014, celebrated her 56th birthday on Thursday aboard the Seabourn Soujourn cruise liner as it arrived in Malaysia. The couple dressed up for the happy occasion with Daniel (54) even sporting a smart, black bow-tie for the special birthday dinner he organised for his beloved wife. Majella, meanwhile, chose an elegant black ensemble with minimal jewellery. "Had a wonderful birthday thanks to my wonderful husband. Thanks for all the good wishes," Majella beamed as she tweeted followers with a photograph of the happy occasion. Cruise control: Majella O'Donnell celebrates another birthday milestone on the high seas. The Tipperary-born mother-of-two has been inundated with birthday messages as she celebrated a second birthday milestone, cancer-free. "Happy birthday Majella. Every birthday is so special when you have had and beaten cancer," wrote one well wisher. The O'Donnells have been voyaging around the world for over three months on the trip-of-a-lifetime that was planned during Majella's cancer treatment. She was diagnosed with breast cancer at the age of 53 in the summer of 2013. At the time, her singer husband expressed his relief that the cancer was caught "in the early stages" and that they were hopeful of a full recovery. Majella fought the disease head-on and publicly shared her cancer journey with the Irish public while giving hope to thousands of other sufferers. She raised more than 600,000 euro for the Irish Cancer Society after bravely having her head shaved live on 'The Late, Late Show' in September 2013. The Donegal couple are now enjoying the closing stages of their round-the-world trip having most recently visited countries including Singapore, Myanmar, Cambodia, Vietnam and China. Next stop on their journey is the Philippines. Meanwhile, the country star took time out to ask fans to vote for his drummer of five years, Nigel Connell, who has made it through to the semi-finals of 'The Voice of Ireland' on RTE One. "He needs your votes this Sunday to get him through to the final," Daniel told his legions of Facebook followers.